Good Morning, Friends. You're not going to believe this but it took me an hour to make this supa simple card. You're like "no way". Yup! Why did it take an hour to make? Well, a few months ago I had bought pink safety pins and I thought it would be perfect for my card design. Well, I did not know where I had put it. I looked high and low and basically tore my room apart looking for a package of safety pins. I spent 45 minutes looking for those darn safety pins and finally gave up. The good news is I found a gold safety pin! LOL! After looking for as long as I did, any safety pin worked just fine. Do you go through similar problems? You know you bought something and when you need it, you can't find it. 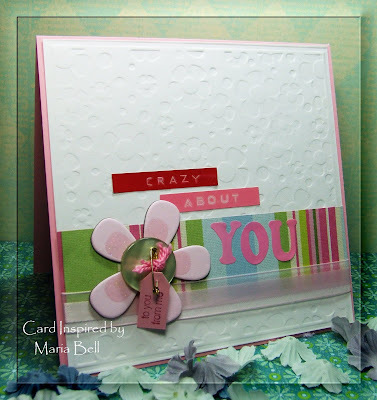 . .
Luv, luv, luv your card Maria!!! I just went through that about 3 days ago looking for a template for my post it holders, it had been sitting on my craft table for about 2 months & just when I need it I can't find it, ugh!!! I spent so much time looking that I was just agravating myself. I might have thrown it away for all I know. I finally gave up & made a new one...but you hate to give up cause you know its around somewhere right? Have a great weekend! 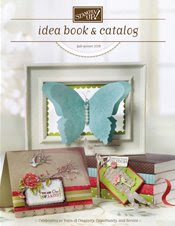 I love the way you use accents...I learn so much from just looking at your cards....fabulous card and great ideas!! The simpler the card the longer it takes to make- totally true! This is a great card- I love the simplicity and simple, clean lines. Very cute. Another awesome simple card! I love your card Maria...so pretty and the colors are very pretty! To answer your question, everytime I clean up my craft area, I usually have to search high and low for small items. It's kind of funny but when my table is a mess, I find everything because I it's out in the open. Love the safety pin... I'm gonna have to use that element. Very inspiring! yea, i hear ya... this happens to me too - alot too... especially because we're alway multi-tasking. Kudos on your card though, turned out magnificento!